The following post originally appeared on Strange Company and is shared here with permission from the author. The story of the queerest tribute to the dead on record comes from Lambertville, in Hunterdon County. Near that town lives Mrs. Elisha Pratt, widow of Deacon Pratt, who was famous as a farmer, a genial soul, and an ardent Methodist. He was particularly fond of tickling his appetite, and was deemed considerable of an epicure. His wife was an excellent cook, and her dinners were rare exhibitions of culinary skill for a rural neighbourhood. The deacon enjoyed nothing better than a houseful of clergymen around a table laden with tempting victuals. And Mrs. Pratt, who doted on the deacon, was in her element when preparing such a feast and helping entertain such goodly guests. About a year ago a number of ministers were on their way to the camp-meeting at Ocean Grove. There were just a dozen of them. Deacon Pratt had them all stop over night at his farmhouse, and gave them a rousing dinner early in the evening. It was a dinner modeled on the New England plan, as Pratt came from Vermont, and so did his wife. There was everything conceivable to eat and plenty of reasonably hard cider to drink. The deacon was in the best of humour, and partook even more heartily than usual of the food. His wife, accustomed as she was to her husband’s large appetite, was astonished at the amount he consumed. and made a mental inventory of the various articles and the amount of each that he swallowed. 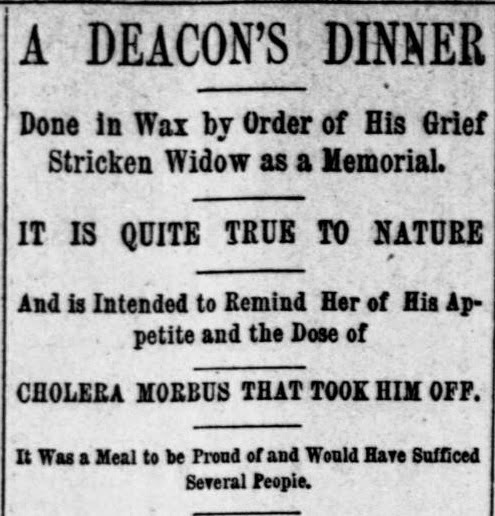 The next afternoon Deacon Elisha Pratt died of cholera morbus. The physician said the dinner knocked him out. The funeral was the largest the neighbourhood ever knew. Eight of the twelve clergymen present at the dinner acted as pall-hearers, and the other four officiated at the church and by the grave.